The world’s greatest lover was the world’s poorest financier. If Rudolph Valentino had any bank balance at all when he died, it was but a few hundred dollars, his close friend, Joseph Schenck hazards. Last year the sheik earned between a million and a million and a quarter dollars and spent virtually every cent of it. There was no reverence for money in “Rudy’s” makeup. There was no bent-for its accumulation. Valentino was prodigal, gullible. If he saw something he wanted whether an automobile, a tapestry or a fishing pole he bought it, regardless of price says Schenck., head of United Artists. “I should judge his home at Hollywood was worth $75,000. He always owned four of five cars and some riding horses. “For his home, he bought many painting s and tapestries often at inflated prices. He had a collection of fencing foils, and another of guns/ “Anybody could touch him. He carried $50,000 personal insurance. Friends often advised him to increase the amount, but here again is Valentino’s disregard for money was manifest. Accumulating lasting wealth in life or leaving it in death meant nothing to him. “But for his business manager George Ullman, he might easily have died broke.” Valentino had a 50% interest in the net profits of “The Son of the Sheik” and “The Eagle.” These two pictures still are playing over the country, and the Valentino Estate doubtless will receive a comfortable amount from them. His salary from the production organization of United Artists was $6500 per week $338,000 a year. For making each of his earlier pictures of importance, Valentino generally received $200,000 and a 25% share of the profits. So far, as Schenck knows Valentino never invested in stocks or bonds and owned no real estate other than his house. Thus his estate is without “quick assets” other than his insurance. Both his parents are dead. 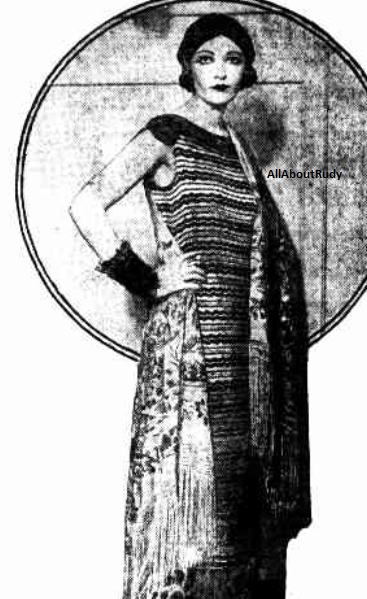 Valentino was unusually fond of his brother Alberto Guglielmi and his sister Maria. He was devoted to Alberto’s children. To these kin, probably will go such worldly goods as failed to slip through “Rudy’s” fingers. The world’s greatest lover was the world’s poorest financier. If Rudolph Valentino had any bank balance at all when he died, it was but a few hundred dollars, his close friend, Joseph Schenck hazards. Last year the sheik earned between a million and a million and a quarter dollars and spent virtually every cent of it. There was no reverence for money in “Rudy’s” makeup. There was no bent-for its accumulation. Valentino was prodigal, gullible. If he saw something he wanted whether an automobile, a tapestry or a fishing pole he bought it, regardless of price says Schenck., head of United Artists. “I should judge his home at Hollywood was worth $75,000. He always owned four of five cars and some riding horses. “For his home, he bought many painting s and tapestries often at inflated prices. He had a collection of fencing foils, and another of guns/ “Anybody could touch him. He carried $50,000 personal insurance. 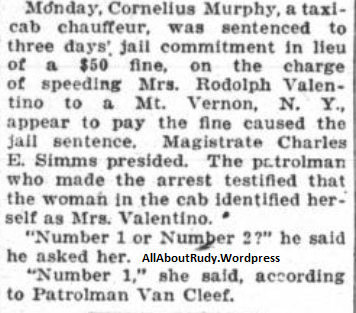 Friends often advised him to increase the amount, but here again is Valentino’s disregard for money was manifest. Accumulating lasting wealth in life or leaving it in death meant nothing to him. “But for his business manager George Ullman, he might easily have died broke.” Valentino had a 50% interest in the net profits of “The Son of the Sheik” and “The Eagle.” These two pictures still are playing over the country, and the Valentino Estate doubtless will receive a comfortable amount from them. His salary from the production organization of United Artists was $6500 per week $338,000 a year. For making each of his earlier pictures of importance, Valentino generally received $200,000 and a 25% share of the profits. So far, as Schenck knows Valentino never invested in stocks or bonds and owned no real estate other than his house. Thus his estate is without “quick assets” other than his insurance. Both his parents are dead. Valentino was unusually fond of his brother Alberto Guglielmi and his sister Maria. He was devoted to Alberto’s children. To these kin, probably will go such worldly goods as failed to slip through “Rudy’s” fingers. whether he comes to me or I go to him. He does not look just as he used to either. He looks more as his music sounded, if you can imagine what I mean. You see, there does not seem to be the right kind of words to tell these things with understanding. Because I knew something about life after death before I came over, it has not taken me long to find myself. That is, to acclimate myself to these new conditions. My automatic writings which you enjoyed so much Natacha taught me a great deal. We did not pay attention to them as we should. It was so easy just to find them interesting. It is difficult to put real help and advice into our daily lives, isn’t it? I have seen many lovely houses over here. The houses are built by spirits who have learned how to mould this thought force. It is all done by the thought process. These are numerous other messages dealing directly with his experience on the astral plane. He has foretold her of coming inventions. The most recent is a sled-shaped affair upon which we will sit pull a lever and fly through the air via radio control. 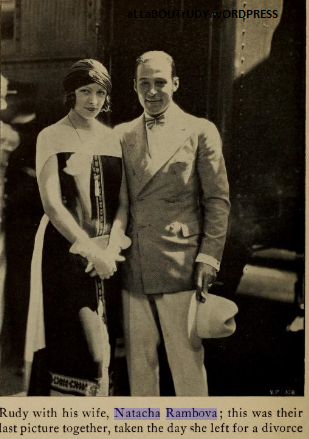 People often ask Miss Rambova how she knows so certainly that it is Rudolph Valentino talking to her? She answered ‘But if your husband called you on the telephone would you not recognize his voice’? In his enthusiasm he often misused certain English expressions. He uses the same semi-Italian semi-American phrases in talking now. Naturally, we could write a book on this subject. She talked to us for more than 2 hours as unaffectedly as though she were discussing the Presidential elections. We may believe or scoff, but we could not but believe that she was sincere. “And do you think that Rudolph Valentino stalks at Falcon Lair?” We had waited until the end to put that question forth. Miss Rambova replied he returns there of course. It was his home. It was only natural that he should come back, is it not? As for the dogs naturally they could see what you could not. Animals have more psychic than persona. 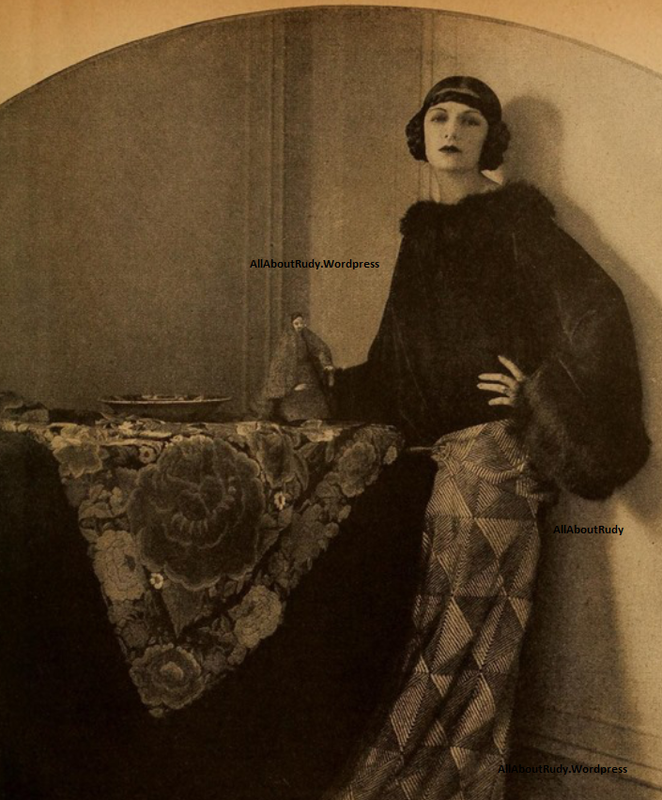 In 1924, for Motion Picture Magazine Natacha Rambova poses for famed photographer Russell Ball. 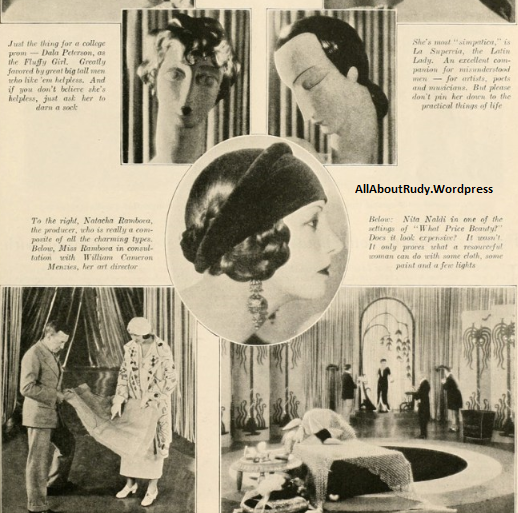 This year and it is with pardonable pride that Movie Classic Magazine presents this exclusive scoop story upon the occasion of the commemoration of the 8th anniversary of Rudolph Valentino’s death. How can his memory be honored more fittingly than by the announcement that you may see him on the screen again? There has never been a autobiography of a motion picture personality before. Can it be that Rudy sensed his destiny as an immortal? Could he have felt that his admirers would remain faithful All these years? Did he recognize the demands of his public to see him after death and therefore provided an undying memorial? These are questions to which you and I will never know The answers. We can only guess. Amateur photography was one of Rudy’s hobbies. As a large number of star’s today are devotees of the amateur or 16mm camera, so did he experiment With standard-size moving pictures. In a particularly gay mood, it was his pleasure to send for a studio cameraman to film little impromptu plays that he enacted for his own guests amusements. This private film was later screen at other parties. In rummaging through some of Rudy’s effects his brother uncovered reels and reels of it. The reason this film was not discovered sooner that the cans containing it were thought to be merely discarded screen tests. It must be remembered that Alberto saw very little of Rudolph in the latter span of his life. The brothers were separated by half the world one in Italy the other in Hollywood. From time to time, there had been talk of a long-lost private Valentino film. 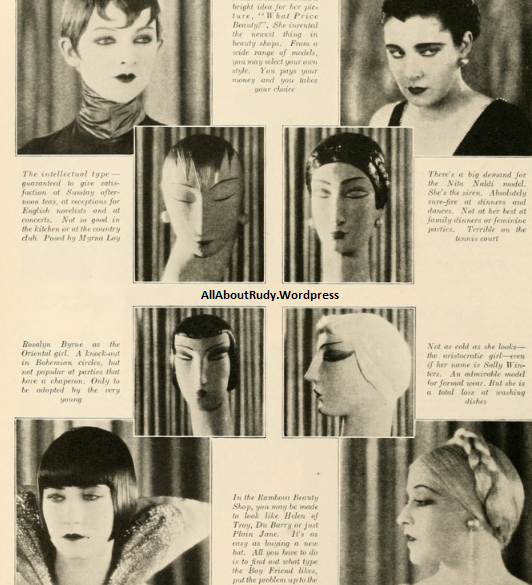 Pola Negri once told me of it. Regretting its loss. Now it has been found. I have seen several reels in a projection room. Even in uncut un-chronological form, the film is tremendously impressive. 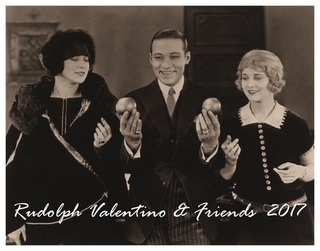 Imagine if you can, a smiling, laughing Rudolph Valentino, a care-free vital fellow at play a tender lover. It is a far more revealing portrait of the actual person than was ever discovered. In a compromising situation by his wife and Rudy. His wife takes Alberto away by the ear and Rudy proceeds to spank Pola. There are many informal pictures posed in the swimming pool. Once Pola is seated astride a rubber sea horse waving at the camera, when Rudy suddenly dives to upset her for a ducking. Several other times there are evidences of his fondness for practical joking. With Natacha Rambova he is more sedate, the nearest approach to a playful mood being a romp with his dogs on the lawn of his Whitley Heights home. Jean Acker his first wife, appears only one time and never with Rudy. The identity of some of the other ladies who play with Rudy in this, his greatest film may never be known except to themselves. Others, of course, are well remembered actresses of the day Agnes Ayres, Nita Naldi, Alice Terry. The wedding of Mae Murray to fake prince David M’Divani consumes nearly a reel. The reception held at Valentino’s home is peopled with famous guests. Contrasting With such intimate scenes is the large amount of scenic footage taken with Rudy as the cameraman. His devotion to beauty and appreciation of it could have no more convincing proof than the pictures of his beloved Italy. He achieved startling and breath-taking pictures of imposing cathedrals and quaint little churches. He realized fully the art of the motion picture camera and made use of it with the masterful Hand of a true artist. The camera was an important part of his luggage when he made his last trip to his native land. He must have spent days traveling about, photographing things that caught his fancy Preserving bits of beauty in celloid that he might again enjoy them upon his return to America and work. There are several dozen views of the exquisite bay of Naples. Scenic Italy has been the subject of many Screen travelogues. But you have never seen it as Valentino photographed it the man was homesick and his nostalgia is evident by his almost reverent presentation of his beautiful homeland. 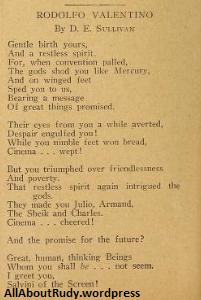 Thousands of writers Have penned great epitaphs for Rudolph Valentino. Yet he unconsciously wrote a greater one for himself I loved beauty. Rudy also photographed the magnificent castle on the Hudnut estate. It is Believed that he took them after his separation from Natacha Rambova the girl he married under her screen name and continued to love until his death. Only once did Valentino take his camera with him to the studio and then solely for the purpose of filming his blooded Arabian horse in action. Is Alberto’s possession more than a reel of film taken at Rudy’s funeral in New York and Hollywood. Thousands of people can be seen lining the streets of both cities. Movie celebrities by the score came to bid a final farewell Charlie Chaplain, Mary Pickford, Douglas Fairbanks Sr, Harold Lloyd, The Talmadge’s Joseph Schenck and hosts of others attended the services It comprises an imposing climax for the screen’s first autobiography. 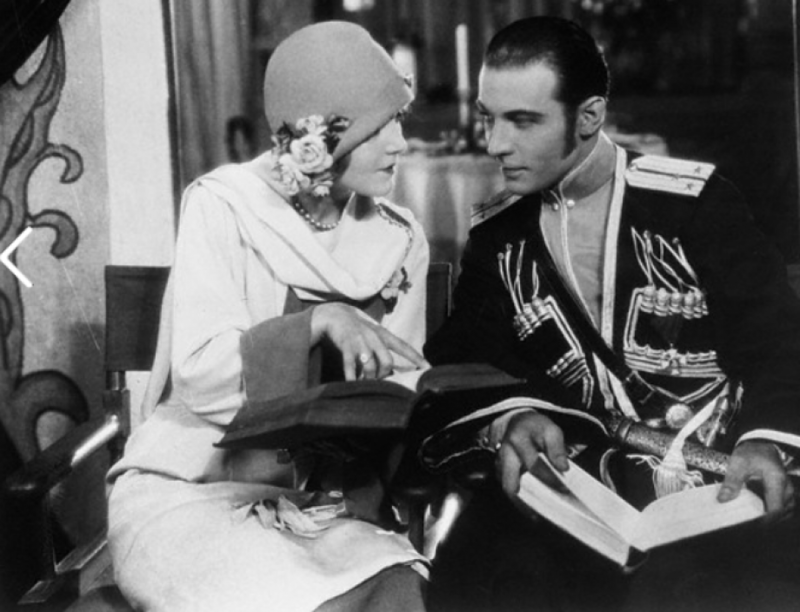 Rudolph Valentino lives again on the screen! A film record of his most intimate private life has been recently discovered by Alberto Valentino the late film star’s brother. It is possible that the memoirs of the movies greatest lover may be released to the public within the next few months.